If you saw Beyond The Lighted Stage (the Rush documentary) then you already knew Rush has a bit of history with the city of Cleveland. 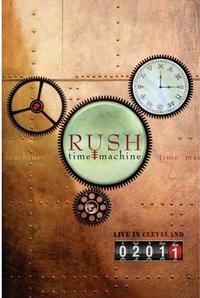 For those of you who don’t know the back story, Cleveland was the first US city to really embrace Rush; especially the cut “Working Man.” With that in mind, it makes perfect sense to have Cleveland as the location to film their last tour. This last outing served two purposes: the first being a celebration of their Moving Pictures album and the second reason was to showcase a couple of new tunes before they immortalize them on vinyl (make that CD). To celebrate Moving Pictures, the band decided to play the whole record from start to finish. Many of the tracks have been played live over the years and have been staples in their setlists since 1981. The real treat was seeing “The Camera Eye” played again. It hasn’t been performed live since the last date of the original Moving Pictures Tour. The reason I gave that little intro is so you would have a sense of what this DVD is all about. This release follows the exact show just as it happened. You get all the funny intros and outros along with every note played. The first set consists of some hits along with a couple of more obscure tracks like “Presto” and “Marathon.” They also play two unreleased tunes during the show with “BU2B” being added to the first set. The second set consists of mainly Moving Pictures with a few hits and the other new track “Caravan” thrown in. Of course no Rush show is complete without Neil Peart’s drum solo and it is on this DVD in all of its glory. To end the show, the band reworked a couple of older tunes, the last one being “Working Man.” It was as if they were completing the circle but ending with the song that started it all for them in Cleveland. The whole event was captured beautifully with just the right amount of cut-aways and angles. The lighting and sound were great on this tour and this DVD captures it really well. There are some bonus features as most DVDs have now, but only two of them will get repeated plays; the older footage of “Need Some Love” and “Anthem.” The outtakes from their intro films are fun to watch once but really don’t need to be seen multiple times. It does show that the band have a good sense of humor and while they make take their music seriously, they certainly don’t take themselves seriously. All in all, this is another great addition to the Rush catalogue of DVDs.